During the years from 1961 to 1963 I worked in the admissions department with then director Charles Dalton ’20, ’43 (MA) and then associate director Caro FitzSimons Spencer ’20. From my experience with children and grandchildren I feel this attention is not always the case at other institutions. 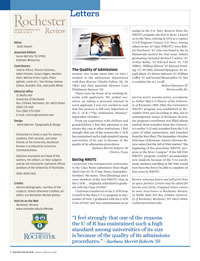 I feel strongly that one of the reasons the U of R has maintained such a high standard among universities of its size is because of the quality of its admissions procedures. I had been transferred to the U of R from Cornell in the Navy’s V-12 program in September of 1944. I graduated with the U of R Class of 1947 and was commissioned as an ensign in the U.S. Navy Reserve from the NROTC program, the first to do so. I stayed on in the Navy, retiring in 1974 as a captain (Civil Engineer Corps), U.S. Navy. Among others in my ’47 class (NROTC) were Robert Prochnow ’47, who was listed in the In Memoriam section for that issue. Others graduating included Richard Carlson ’47, Arthur Bailey ’47, Edward Kern ’47, ’72S (MBA), William Shriver ’47, Edward Dowling ’47, ’48 (MS), Edward Spurgiesz ’47, Joseph Mack ’47, Henry Sakrison ’47, William Coffey ’47, and Samuel Miserendino ’47. Not a complete list as I recall. Editor Scott Hauser notes: According to Arthur May’s A History of the University of Rochester, 1850–1964, the University’s NROTC program was established in November 1945, and according to May and to contemporary issues of Rochester Review, the program’s enrollment was filled almost entirely from transfers from the University’s earlier V-12 unit, transfers from the V-12 units of other universities, and transfers from the Navy fleet. The September-October 1946 issue of Rochester Alumni-Alumnae Review notes that the fall of 1946 marked “the beginning of the peacetime NROTC program at the River Campus.” If the fall 1945 NROTC program couldn’t accommodate new students because of the V-12 enrollment, students enrolling in fall 1946 would have been the first to be able to complete all four years in NROTC.